Directions from Los Angeles: I-5 freeway south towards San Diego. Take the 805 freeway south to the first exit which is Mira Mesa Blvd. Turn left at the light and follow underneath the overpass staying in the right hand lane. Make a right turn on Scranton Road. Scranton Road turns into Carroll Canyon Road. Make the first right onto Nancy Ridge Drive. Our building is on the right hand side. The company sign "Canyon Materials, Inc." is affixed to the top of the building at 6665 Nancy Ridge Drive. Directions from San Diego: I-5 freeway north. Exit at Sorrento Valley Road. Turn left at the first cross street. Immediately turn right at Sorrento Valley Blvd. Pass over the railroad tracks and immediately turn right at Sorrento Valley Road. 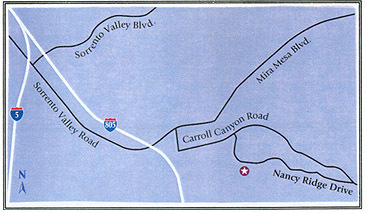 Sorrento Valley Road crosses the 805 freeway and becomes Mira Mesa Blvd. Make a right turn on Scranton Road. Scranton Road turns into Carroll Canyon Road. Make the first right onto Nancy Ridge Drive. Our building is on the right hand side. The company sign "Canyon Materials, Inc." is affixed to the top of the building at 6665 Nancy Ridge Drive.